HALIFAX—The Department of Fisheries and Oceans has announced the closure of 10 of its 22 Coast Guard Marine Communications and Traffic Service (MCTS) Centres. The MCTS Centre in Inuvik has already been closed, leaving Iqaluit as the only one left in the territories. The centres in St. John's, St. Anthony, Saint John, Rivière au Renard, Montréal, Thunder Bay, Tofino, Comox, and Vancouver are slated to be closed before 2015. The Halifax MCTS Centre will remain open, but will need to expand its duties to cover work currently done by its counterpart in Saint John. The base closures are a result of deep cuts to the Department of Fisheries and Oceans (DFO) made in the 2012 Conservative budget. For the 2012-2013 fiscal year, the federal government reduced the DFO's budget by 8.3%, which equates to $150.9 million. By maintaining fewer MCTS centres and employing fewer Marine Communications and Traffic Service Officers (MCTSOs) to staff them, the DFO will save money. The cost of saving money has raised concerns among those who work to ensure mariner safety, however. Chad Stroud represents Coast Guard MCTSOs as the President of CAW Local 2182. He explains that MCTSOs respond to Mayday calls, co-ordinate search-and-rescue efforts, monitor vessel movements by radar, warn mariners about potential hazards, direct boat traffic, monitor marine radio channels, and perform other services to ensure the safe and efficient flow of marine traffic. They are the "eyes and ears" of the Coast Guard. There are currently 350 MCTSOs in Canada. On May 17th, 2012, 184 of those received letters indicating that they would be affected by the cutbacks. Some were told that they would be relocated to another Coast Guard base, while others will be laid off or reassigned to other positions in the Coast Guard. Rather than relocate themselves and their families, some MCTSOs have chosen to retire early with a reduced pension. Stroud went on to explain the specific problems that the cutbacks create for mariner safety. The first problem is that there will be fewer MCTSOs to provide services in any particular area. The DFO refers to its process of closing Coast Guard bases as "integration," as some of the workers from a closed base are relocated to another base. However, not all workers retain their jobs. Some workers from the closing Saint John base are slated to be relocated to the Halifax base. Currently, Saint John and Halifax employ a total of 42 MCTSOs. After integration, Halifax will employ 34 MCTSOs to do the same amount of work. The case of St. John's and Placentia is similar; they currently employ a total of five MCTSOs, but will only employ three after integration to Placentia. The second problem is that these cutbacks will reduce the amount of local knowledge that MCTSOs have of their area. Each MCTSO has an Area of Responsibility (AOR) that he or she services. As a result of the integrations, MCTSOs will often be stationed far from their new AORs, and will have to rely on two weeks of classroom instruction to know about their traffic patterns and potential hazards. Stroud stressed the importance of having people with local knowledge of an area on the radio: "The way MCTS works, local knowledge is the most important thing. Knowing about the currents, the tides, and local geography is absolutely critical when mariners are calling up. A lot of times, they're saying things like 'I'm in danger in God's Pocket.' Well, 'God's Pocket' might not be on a current chart, because that's the local name. We need to know where they are as soon as possible." Coast Guard workers, who spoke on condition of anonymity, recounted their own experiences to illustrate the importance of being physically present in their AORs. One said that a potential collision was averted because an MCTSO looked out the window and saw a ship in the harbour that was too small to appear on radar. Another said that high winds had knocked down the radio antenna that was normally used to talk to ships, and that he used the antenna on the top of the Coast Guard station instead. Were they located in a different base, this would not have been possible. The third problem posed by the integrations is that they require each MCTSO to cover and be knowledgeable about a much larger area. The Saint John base, for instance, covers the entire Bay of Fundy to the north and east, to the American border in the west, and to the vicinity of Yarmouth, Nova Scotia, in the south. Halifax personnel will soon need to cover all of this in addition to their current AOR. Some workers expressed particular concern about this, because Saint John helps to ensure the safe travel of vessels that carry dangerous cargo, such as crude oil and liquefied natural gas. The fourth problem is that the remaining MCTS centres will rely on a new and unproven computer system. Iqaluit, which recently implemented the new system, is already experiencing problems. On May 23rd, 2013, it issued a Notice to Shipping to warn mariners that its services were unreliable. The Notice reads: "IQALUIT MARINE COMMUNICATIONS AND TRAFFIC SERVICES. ALL REMOTE CONTROLLED MF/HF/VHF TRANSMIT AND RECEIVE FACILITIES LOCATED IN INUVIK, CAMBRIDGE BAY, HAY RIVER, ENTERPRISE, PARSON'S LAKE AND YELLOWKNIFE UNRELIABLE 231300UTC UNTIL FURTHER NOTICE." As of May 31st, no further notice has been issued to indicate that the problems have been resolved. Stroud summarized his concerns: "This drastic reduction in essential services---because that's exactly what it is, essential services---has been done to save money, not to save lives. 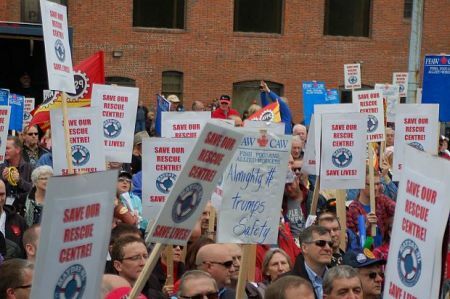 This reduction in the MCTS centres will result in a decreased ability to hear that critical Mayday that could be happening...We just can't see it, under the new model, being as safe as it is right now." Since MCTSOs provide essential services, they are legally prohibited from striking. Instead, they have lobbied the Commissioner of the Coast Guard and both the Minister and Deputy Minister of the DFO to rectify these issues. These lobbying efforts have been unsuccessful. The MCTSOs have received support from non-Conservative MPs, but to date, no Conservative MP has spoken out against the cutbacks. The Coast Guard workers are now taking their case to the Canadian Marine Advisory Council. Some workers are concerned that the Coast Guard is cutting back essential services while awarding significant bonuses to its high-ranking officials. CAW Local 2182 has requested information about these bonuses through the Treasury Board's Access to Information Policy. The Treasury Board responded that information about bonuses is not released due to privacy concerns. 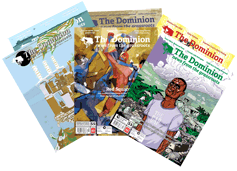 The base salary of every government employee in Canada who earns more than $100,000 per year is legally required to be in the public domain. Keith Ashfield, the Minister of Fisheries and Oceans, announced the closure of the 10 Coast Guard MCTS centres in question on May 17th, 2012, in a press release entitled "Canadian Coast Guard to Improve Marine Communications and Traffic Services." The press release did not mention budget cuts, saving money, or the reduction of personnel. It suggests that technological upgrades to the 12 MCTS centres that are to remain would improve services due to increased integration. Keith Ashfield has not responded to requests for an interview. While the Coast Guard has taken much of the brunt of cutbacks to the Department of Fisheries and Oceans, other DFO departments have been affected as well. The Experimental Lakes Area, an outdoor laboratory that was used to study the effects of water pollution, has been closed. The entire toxicology contaminants team in St. Andrew's, New Brunswick, was also cut, which studied the effects of industrial pollutants on water supplies. Seven libraries operated by the DFO will close by the fall, including a library that was built last year in St. Andrew's. This is not the first time that a compromise in Coast Guard services to save money has caused controversy. On February 19th, 2013, the federal government suddenly closed British Columbia's Kitsilano Coast Guard Station. It was the busiest Coast Guard station in Canada. On April 12th, 2013, a freighter crewmember died of a heart attack in English Bay. Bill Tieleman, spokesman for the Union of Canadian Transportation Employees, said that paramedics would have arrived 15 minutes sooner if the Kitsilano base was still open. The Kitsilano closure is estimated to save the federal government $700,000 per year. In April 2012, the federal government closed the Maritime Rescue Sub-Centre (MRSC) in St. John's, Newfoundland. According to the Coast Guard, MRSC St. John's responded to approximately 500 calls every year, involving 2,900 people. In the average year, Coast Guard personnel operating from that base saved 600 lives. Announcement of the closure was met with vocal opposition and protests. 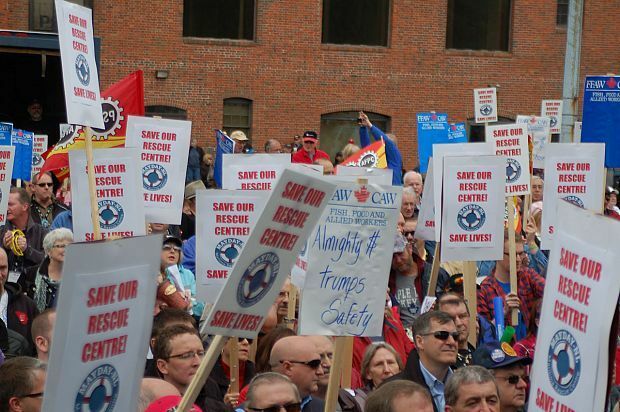 At a protest in St. John's, one speaker summed up the concerns of those opposed to Coast Guard cutbacks when he said: "It's more important to save lives than it is to save money."